Virtual reality (VR) can sometimes make us feel isolated, cut off from your friends and familiar surroundings with only AI companions and enemies for company. That can make the experience more powerful and immersive – but also lonely. But, don’t despair and yank off that headset just yet! VR has a ton of multiplayer games available across most headsets, many with cross-platform support, so you’ll be able to play and chat with fellow VR enthusiasts around the world. Even family and friends who don’t own their own headsets can sometimes get in on the fun! Here are our current favorites for local and online multiplayer across a variety of genres. The perfect game to play with your non-gamer family and friends, Keep Talking and Nobody Explodes is all about frantic communication and teamwork. One person isolated in a VR bubble must disarm a bomb; that person describes the bomb’s circuitry, and his or her teammates must find the solution and describe it back before time runs out. Each level gets more and more tricky, with things like confusing homonym passwords, mazes and Morse code, until your friendships will either dissolve into hatred or become stronger through shared struggle. Imagine Mario Party, but if every mini game was an asynchronous Bowser mini game, with one super-powered enemy fighting four plucky heroes. This free bundled PlayStation VR game basically makes the VR headset wearer Bowser, facing off against – or sometimes joining up with – everyone else staring at the TV sans headsets. In some games you’re a big cat hunting robot mice, or a massive sea creature throwing projectiles at fleeing bots. In another mini game everyone teams up to hunt down and vacuum up ghosts, Luigi's Mansion-style. Whoever’s wearing the headset, though, everyone in the room will be cracking up together. Currently the most popular social VR app, Rec Room combines casual social hangout rooms with a variety of mini games – laser tag, dodge-ball, paintball, charades, etc. – and 3D creation tools for making your own games or social rooms. At its best Rec Room will let you meet and make new friends; at its worst, like any online forum, you’ll run into jerks and creeps. So, get the mute and block buttons ready, keep your kids and teenagers off of it unless you’re ready to constantly supervise, and consider more curated experiences like Facebook Spaces if you only want to hang out with friends you already know. As someone who lives across the country from his old board gaming get-togethers, Tabletop Simulator in VR provides a pleasant way to hang out and compete with friends (or strangers) thousands of miles away. It officially only ships with 15 straightforward games, like chess and poker, but since the game released in 2014, community members have created thousands of digital versions of more modern favorites, like Settlers of Catan, Spirit Island Deluxe, Star Wars Armada, Gloomhaven, Betrayal on Haunted Hill, Secret Hitler, Munchkin and truly so many more. 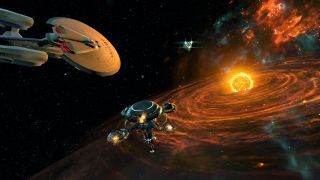 Ubisoft’s four-player cooperative VR game set in the Original Star Trek universe (or Next Generation if you buy the latest DLC) really gets to the heart of Star Trek’s mantra: working together to overcome any obstacle. Star Trek: Bridge Crew isn’t for the socially awkward, as you’ll need to communicate clearly and quickly with your three fellow Trekkies to beat back the Klingons and Borg or save the Kobayashi Maru crew. Ubisoft’s cross-play means you can play with friends on other types of headsets than yours, but even without VR-owning friends you’ll hopefully find a solid crew of strangers to boldly go together. A free spin-off of the amazing Oculus-exclusive space adventure Lone Echo, Echo Arena throws players into zero-G with only rocket boosters and their fists, and tasks them with throwing a disc into the opposing goal. You’ll love coming up with tactics to outsmart or outmaneuver opponents – or just charging forward for a no-gravity boxing match with your Touch controls. Last month, developer Ready at Dawn will also released Echo Combat, which will ditch punching and frisbees for lasers and a payload to drag into the opposing base. It’s basically Ender’s Game brought into VR and looks amazing. Plus, anyone interested in starting up an eSports career should try building up their Echo skills, because Oculus will host tournaments in 2019. Some people prefer ultra-precise realism in their tactical shooters to cartoonish or sci-fi action. For those people, 5v5 Mii-Sim tactical shooter Onward is truly the best option available. Whether you’re in a multiplayer match or a co-op skirmish against bots, constant communication with your squad is vital to success. With a dedicated fan base, you’ll never have to wait long to hop into a match. Picking just one racing VR game is nearly impossible, and mostly up to personal preference. Assetto Corvo may be the most realistic-feeling sim for true car enthusiasts. Wipeout Omega Collection is a great F-Zero-esque choice for PS VR users, iRacing provides the best head-to-head online multiplayer for skilled racers, and the Tron-like endless racing arcade game Distance is a fast-paced good time. But DiRT Rally arguably takes the cake for overall most enjoyable experience, with the most exciting race courses and user experience. You can race directly against opponents in rally cross mode or compete against leader boards and friends' times.